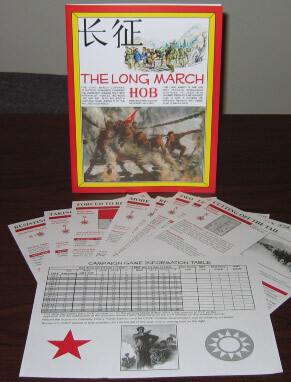 The Long March (TLM) is the first pure scenario pack (i.e., new scenarios without maps or counters) that Heat of Battle has published in a long time, since 2002’s Buckeyes! Given HOB’s problems with printers in recent years, perhaps this more modest offering was a relief, of sorts, to them. In any case, TLM is a large scenario pack (17 scenarios! ), all of which are designed by Jay Long and focus on the first phase of the Chinese Civil War (roughly 1931-1936) between the Chinese Communist Party led (for the most part) by Mao Zedong and the Guomindang (GMD) led by Jiang Jieshi (Chiang Kai-Shek). Most, but not all, of the scenarios focus more specifically on actions that occurred during the so-called Long March of 1934-1935, when the Chinese Communists went on a tortuous ordeal under fire to relocate their base from southern China to Yenan in northern China. It was this difficult rite of passage that forged a new movement powerful enough to survive through the Sino-Japanese War of 1937-45 and prevail in the second phase of the Chinese Civil War (1946-1950). As a subject for ASL, the Long March is fraught with difficulties. The first is that it is certainly a fringe topic. Even PTO-themed ASL products don’t sell as well as, say Eastern Front themed products, and this is a subject considerably more esoteric than the PTO. So it must be noted from the start that this is not a product for everybody, but rather aimed more at those people who like the more unusual ASL settings, those people who like the Chinese in ASL, and those people willing to try new things and have different experiences in ASL. It will never be a best-seller, but it does have its audience. The second issue is that the actions of the Long March, and reflected in TLM, are infantry actions. The GMD had precious few AFVs at this time, and virtually none in many of the areas where the Long March took place; the CCP’s Red Army (later People’s Liberation Army) had none. Nor did these forces have much else in the way of heavy weapons. As a result, there are not many battlefield “toys” to play with in the scenarios in TLM, not compared to a typical European-based scenario. This is another factor which may decrease somewhat the size of the audience interested in TLM, though it is not through any fault of the product itself. The third, and in some ways most serious, peril for a product like TLM is that there is very little material available in English on this subject–far less than one might think for such a momentous event. Moreover, virtually all of the material either directly or indirectly comes from Communist sources, and this poses its own problems. The result–which this reviewer can attest to personally–is that it is difficult to get good, detailed information on which to base a Long March-related ASL scenario. Unless one goes to extra effort, and sometimes even then, scenarios based on Long March actions will tend to be fairly generic and considerably hypothetical in nature, as designers struggle with serious gaps in the information. ASL players, especially “historicist” players, have to give such scenarios more leeway than they might give designs on other subjects. TLM includes 17 scenarios. There is a decent mix of scenario sizes, including 4 small scenarios, 5 medium scenarios, and 8 large scenarios. Because heavy weapons and AFVs are so rare in most of the scenarios, a number of them will play “faster” than their size might otherwise indicate. There are no night scenarios, nor scenarios with OBA. One scenario has Air Support. Unfortunately, in fully 9 of the scenarios, Dare Death squads are disallowed, which removes one of the few colorful national characteristics that the Chinese forces (both sides) possess. A couple of scenarios have extended special rules in order to simulate things such as bridge-laying and Chinese city walls (for which ASL really needs an overlay). One scenario, LM11 (Medieval Warfare), uses DASL, while another one, LM11 (More Than Four Horsemen), uses boards from the HOB map pack High Ground! Heavy weapons are extremely scarce and machine-guns and other SW hardly more numerous in TLM scenarios. 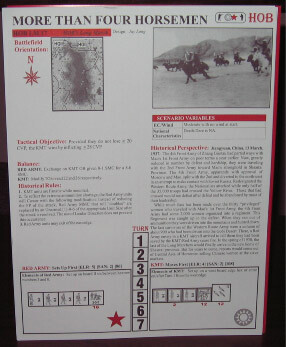 All of the 17 scenarios put together contain a total of 4 guns and 2 vehicles (a couple of scenarios do include Cavalry, while one includes an assault boat). SW are also rare; a total of 47 SW (43 MG and 4 DC) are all that appear in the scenario pack. Indeed, in 10 scenarios at least one side has no SW at all; in 3 of those, neither side has any SW. This may understate to some degree the actual number of weapons at the disposal of the combatants. Even the Red Army, which had arms shortages even past 1945, was reported to have had in Oyuwan in 1932 some 40k rifles, “plus machine guns, mountain howitzers, mortars, and wireless equipment.” Obviously, the Red Army would have lost some of this equipment during the fighting in the early 1930s, as well as on the Long March itself, but even as late as January 28, 1935, in fighting at the town of Tucheng, Long March veterans later complained that the GMD shelled them all day long while their own artillery (basically mortars) ran out of shells after only a few shots. One Web source, quoting the Statistical Chart of Field Army Personnel, Weaponry, Ammunition, and Supply, suggests that on October 8, 1934, the Red Army had 38 field mortars, 1 mountain gun, 333 HMG, and 285 LMG. How to represent these statistics in a suitable proportion for scenario OBs is a difficult question, though, because the exact total number of combatants in the Red Army (as opposed to non-combatants, soldiers held out of action for lack of weapons, etc.) at any given time during the Long March is often difficult to determine. One might have wished a few extra support weapons somehow squeezed into the scenarios, but there is not enough information to fault the designer on historical grounds. Given the generic nature of many of the forces arrayed against each other in the scenarios, it might have been nice if there had been more use of “artificial” ways to make forces more interesting, such as random or purchasable reinforcements, special rules, etc., but such techniques were not employed very often. One scenario, however, that does employ an imaginative notion is LM8 (The Race to Loushan Pass), in which prior to set up, players make a secret bid that will determine who will move first and even get a special pre-game movement phase. On the other hand, the general lack of such items, as well as the lack of heavy weapons, make many of the scenarios in TLM very good introductory scenarios, scenarios that can help beginning and novice players obtain a grasp of infantry tactics. Some, too, seem as if they would be very fast playing and might be good options when time is limited. In addition to the basic scenarios themselves, HOB honcho Steve Dethlefsen designed a linking structure that would allow 14 of the scenarios to be played sequentially in a sort of campaign game. After finishing 14 scenarios on the same subject, some might feel they had actually taken part in the Long March! What’s the verdict overall? Ironically, both the main appeal and the main turnoff of the scenario pack is its obscure subject matter. Some will not be interested by it, but for those for whom the Long March would appeal, the scenarios in TLM offer a lot of possibilities. It is worth noting, perhaps, that prior to the publication of this pack, the entire oeuvre of ASL scenarios, official and unofficial alike, included hardly any CCP-GMD actions. This pack in that sense is a pioneering effort that opens the door for more designers to begin exploring Chinese vs. Chinese actions from 1930-1950. Though the lack of AFVs, heavy weapons, and SW make some of the scenarios here perhaps seem a little vanilla, there are enough different types of actions here that most people will find scenarios in the pack that are to their liking. Overall, it looks pretty interesting.